Ajax came into this game needing a win to secure their 30th Dutch Eredivisie title while FC Twente needed just a point to give them their second title in as many years. The two teams had only just met 7 days prior in the Dutch Cup final where Ajax had let a two goal lead slip and Twente came out champions with a 3-2 victory. Former Ajax great and now coach, Frank de Boer dismissed Ajax cup defeat to Twente by saying, “The cup I see as dessert – they can have that,” and he talked up the grand stand final league match by saying, “Let us win the main dish, the (Eredivisie) championship, which everyone at Ajax is longing for.” The stage was well and truly set. After surviving an early scare from a close range Ruiz effort, Ajax settled well into this contest and took control of the game from as early as the 10th minute. At that point they started to move the ball around with ease due to their exceptional movement off the ball and some non-existent Twente marking. Defensively the reigning champions looked in disarray. Going forward they also didn’t seem to have clue as they quickly gave back the ball to the home team, not so much because Ajax were pressing intensively (because they weren’t) but more so as a result of careless passing. Long balls over the top were won by the Ajax defenders and less than precise passes were easily picked up by well positioned midfielders (and defenders) who quickly transitioned play from defense to attack. The two teams both had a de Jong sibling leading their line, Luuk de Jong for Twente and Siem de Jong for Ajax. Their contrasting performances was reflective of the match pattern. Luuk made life easy in the centre of Ajax’s defense for Alderweireld and Vertonghen. He was immobile throught the first half and only ever really touched the ball when it was sent to him through the aerial route. Most or all of his flick ons were won by covering defenders and it difficult to recall him being able to bring down any of those passes. His brother on the other hand was having a field day toying with Twente’s backline in his role as a ‘false 9’. He caused confusion as Douglas who was assigned to mark him and at times didn’t know if to follow him or pass him on to a midfielder when he dropped into deep positions. When Douglas chose to folllow him he was too late in closing him down and when he left him he did not pass him on to anyone in particular. De Jong was able to control passes, turn and move the ball on under limited or no pressure and won flick-ons with ease. Even in and around the 18 yard area the Brazilian was guilty of giving De Jong too much room. Ajax’s attack was a sight to behold in comparison to Twente’s. While Twente chose the direct route either sending the ball long to their target man or getting it to Ruiz in hope that he produce some magic. Ajax passed the ball precisely along the floor, gave the man in possession ample support and great movement off the ball created space for others. Their main objective seemed to be to get the ball to the right to Sulejmani and attack Twente down that side. Their first goal did come from a cross on that flank however not directly from open play. After the goal Twente started to press higher up the field in an attempt to disrupt Ajax’s passing game. This almost resulted in them conceding soon after as De Zeeuw was able to find Ebicilio with a diagonal pass from midfield who was in behind Rosales who was pushed up higher up the park as the away side looked to equalize. Ajax dealt with Twente pressing high very well. Their two central defenders were unfazed by the pressure from De Jong and Jansen who had pushed up from midfield to help their lone striker press. Anita who dropped deep to collect the ball to initiate attacks was tracked by another midfielder. When Ajax build from the back Twente’s defensive shape was resembling a 4-1-2-1-2 shape. Together with the aforementioned trio Chandli and Ruiz kept a close eye on the both fullbacks and Landzaat paid attention to De Zeeuw. This meant that Erikson didnt have any direct marker and was able to receive the ball in loads of space. 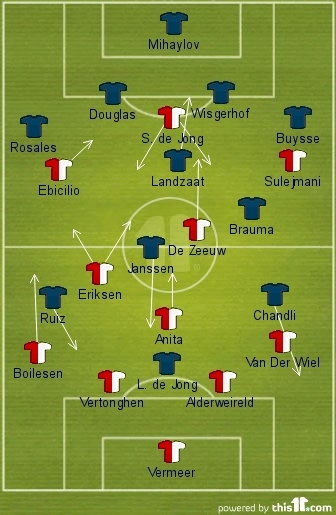 Ruiz was then instructed to pick up Eriksen but this just freed up Boilesen on the left flank who now got forward a lot more. Subsequently, after the opening goal most of Ajax’s attacks came down the left side with Ebicilio and Boilesen being involved a lot more. Twente came out in the second period revigorated by their halftime team talk, intent on getting the equalizer which they needed. They pressed relentlessly and were taking a hold of the game only to concede an own goal and go down 2-0. This goal was created by the movement of Siem de Jong who was able to draw out his marker and the own goal was scored by Jansen who was covering the drawn out defender. Twente was able to pull one back immediately fron the boot of Theo Janssen and was set up by Luuk de Jong who, maybe for the first time in the match, lost his marker and was given space to lay off the pass to the goal scorer. 1) No space left behind by marauding fullbacks for Ajax to capitalize. Preud’homme instructed his fullbacks not to get forward perhaps for the fear of conceding another due to the pace of the Ajax attack. He knew that allowing the fullbacks to push forward would be detrimental and leave them vulnerable to the counter attack. So while Twente attack the fullbacks kept a close eye on the likes of Ebecilio and Sulejmani. 2) Frank De Boer was happy to sit on the one goal lead. Shockingly as the second half went on it seemed as though Ajax were not interested in playing attacking football (a la Cruyff ideology) anymore. They seemed to be not interesting in forcing Twente back by retaining possession but rather they looked for the rare counter attacking opportunity if it came by. Their first half performance was proof that they could have seen off the game by keeping the ball and making it difficult for Twente to build attack but fatigue may have had a lot to do with them adopt a counter attacking strategy as the played the first half at a very high tempo. One can build an argument for both reasons but the second seems to have more weight especially when you take into consideration de Boer’s tactical substitutions late on. In the 67th minute he brought on a defensive midfielder Enoh for Sulejmani to sit in front of the back four. Then after Siem De Jong extended the lead he made a similar substitution by bringing on Ooijer for Ebicilio. Twente two attacking substitutions didnt really bring them much fortune as they still were missing an individual with a creative spark to create chances for the three strikers which they ended the game with. Ajax were deserved winners of this title deciding encounter. The way they played in the first half was similar to Manchester United’s first half in the Premier League title decider versus Chelsea. They play with determination, drive and the motivation that wrestling the title away from the champions was in their own hands just like United. The, now, 3o times Dutch Eredivisie title winners’ style of play in the first half looked miles superior than Twente’s but in the second half the former champion showed why they were just that by never giving up. Ajax seems to be on the up with Frank de Boer at the helm and one can only imagine that they won’t have to wait another seven years before they get another Eredivisie title.